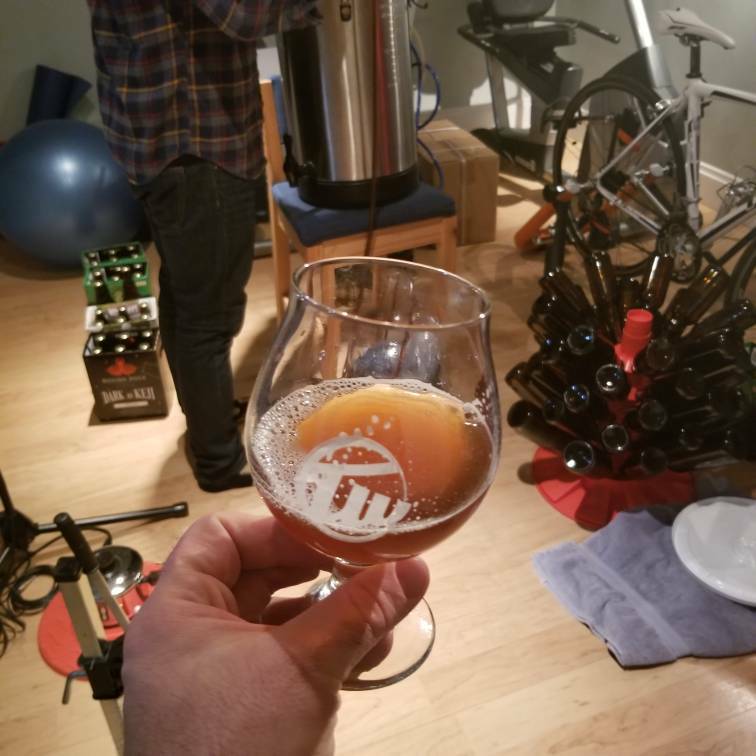 This was my attempt to re-create an amazing beer I had brewed a couple months previous. However, my LHBS didn't have the correct yeast or crystal malt, so I ad-libbed. I wasn't happy with this one at all in the early stages, but the last couple weeks of aging have made this quite nice. Mashed at 148F for 60 minutes. 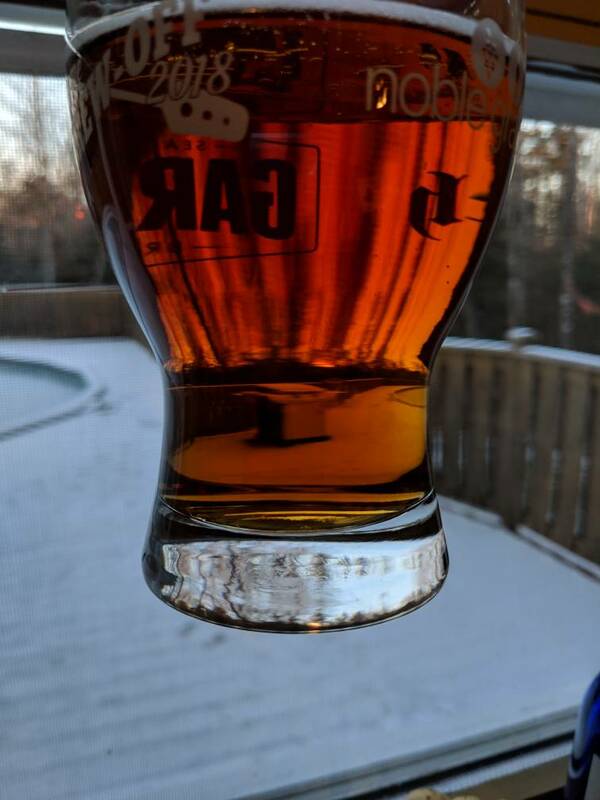 Beautiful beer all around - good carbonation, crystal clear, nice golden colour, smell has a nice sweetness to it, and the taste is super crisp with a nice caramel malt sweetness. I can't imagine you'll have this batch around for long (ie: it's going to go quick!) - thanks for sharing! Wow, not even a huge lager fan but this is hitting the spot. Like Matt said, crystal clear beer, that is something to be proud of on its own. Very flavorful and smells sweet. Excellent beer. I can't believe the quality of the beer so far. First year doing this. Keep them coming. Thanks for the beer. Enjoying this one. Its sweet tasting and refreshing. Great carbonation and clarity. Beautiful beer to look at in the glass. Some really nice malt character on the nose with a touch of spicy and slightly fruity hops that complement the malt nicely. On the palate the malt is also dominant, with some grainy sweetness and a great almost graham crackery presence. Could have a bit more carbonation, but that might be on me for putting it in the fridge a little early. I'm getting some acetaldehyde on this one as well that I think is taking a little away from the finish. I wouldn't call this a "Pale" anything; it drank very much like a Festbier to me and I quite enjoyed it. Still working up to detailed critiques, but I could have this as a go to for sure. It’s delicious. Nice work on the clarity too, probably the clearest home brew I’ve seen. Beautiful colour and clarity! Smells like fresh honeycrisp apple flesh with a hint of banana and a smaller hint of green apple. Really nice resiny type malt flavour (that I had noted as a munich type malt until I took a second look at the recipe) that I like in darker type lagers. Very quaffable. Thanks! CartoonCod wrote: Beautiful colour and clarity! Smells like fresh honeycrisp apple flesh with a hint of banana and a smaller hint of green apple. Really nice resiny type malt flavour (that I had noted as a munich type malt until I took a second look at the recipe) that I like in darker type lagers. Very quaffable. Thanks! Lots of non lager descriptors there Adam. The nose. A combination of acetaldehyde and DMS plus the finish - more a candy caramel that screamed for a crisp humane end detracted from an otherwise very interesting beer. The brewer will have a scoresheet shortly. Haha, finally someone was honest. As I said, I was originally trying to remake a previous beer, but I couldn't get two of important ingredients - crystal 30 and Wyeast 2308. Right from the start I didn't like the crystal 40. I'd also never used the yeast before. I did all of my usual yeast wrangling, but something just didn't work like it should. The clarity - I used a bit of gelatin. I've always wanted to see what sort of difference it makes. Wow, I wasn't disappointed. However, I'm wondering if knocking out all of that yeast impacts the clean up process? Even after about 3 months, there's still some issues. Regarding carbonation levels and such, I bottled from a keg. I don't have an ideal setup for that though. I also wonder if some oxidizing is taking place. Right after I brewed this, I immediately tried again with the original ingredients. I was hoping it was going to be ready in time, and the beer you got was going to be the backup. Sadly, it was nowhere near ready. Interesting about the festbier comparison. I was trying to categorize the original batch a few months ago. That seemed to be the closest comparison, but it was pretty far out of spec. The new batch, which I sampled yesterday, reminds me a bit of the Lunn's Mill Vienna. Anyway, thanks for all of comments! I really appreciate it. Mine was a little undercarbonated, but it didn’t really detract from the beer. Subtle hops and grainy sweetness. Didn’t get any green apple character, but I’m not overly sensitive to it so I’d miss it if not overwhelming. I enjoyed it. Thanks for sharing. A very heavy lager. Great drinking beer but not to style. I'm OK with that! I got some pear/apple on the nose, nice malt character, beautiful clarity and well carbed in my bottle. Similar to a beer my dad makes. Nice and clear, Getting some slight green apple (not sure if that is left over from my own day 4 beer or not), and definitely some sweetness. Crystal clear bronze colour with an ivory head. On the nose there was pear-drops. I picked it up as when i had my gas mask fit tested before the CS Chamber, they'd test with either ethyl acetate or isoamyl acetate and although it's faint, it stirred a memory! Sweet and malty flavours. Carbonation was fabulous! Lacing tracked my fast progress to the bottom of the glass! I don’t have a whole lot different to add from everyone else. To be honest I didn’t notice the acetaldehyde at first - looked for it once I read comments - I can be convinced it a there. Definitely not enough to take away from the beer. As people have said - crystal clear / sweet caramelly and beautifully balanced by hops. Thanks for the brew !! So we're a little behind on the sampling... had this the other night while bottling a dopplebock. Beautiful colour, and nice maltiness.